Papua New Guinea: Papuan activists’ webcast silenced – was Indonesia behind it? A speech by two Papuan activists which was being broadcast live on the internet mysteriously went silent when they started to denounce Indonesian human rights atrocities. The two were special guests at the Public Interest Environmental Law Conference in Oregon, the world’s most important environmental law conference. 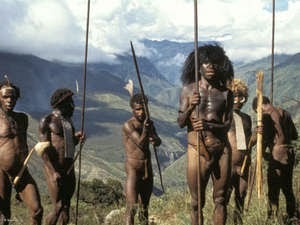 The Papuans are members of the Amungme tribe, whose land is home to Grasberg, the world’s biggest copper and gold mine. They were highlighting the problems facing the tribe in the face of massive environmental damage and human rights violations. Indonesia has occupied Papua (the western half of the island of New Guinea) since 1963, and more than 100,000 Papuans are believed to have been killed since then. In 2010, the website of tribal rights organization Survival international was attacked and temporarily taken offline after it posted shocking video of Indonesian soldiers torturing Papuan tribal people. Other organizations who posted the footage were also attacked. Survival International’s Director Stephen Corry, in a separate speech at the conference, highlighted the role of ‘conservation’ in the continuing destruction of tribal peoples, and showed how conservation theories grew with ‘scientific’ racism, which underpinned colonial genocides and the Holocaust. He also denounced the false claims, promoted by popular science writers Steven Pinker and Jared Diamond amongst others, that tribal and indigenous peoples are ‘like our ancestors’, and ‘more violent’ than us.